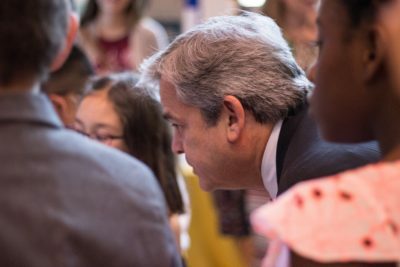 Buzzing with energy, ideas – and even a beekeeping suit – students and their proud teachers showed off EcoRise-funded sustainability projects from their schools in the Atrium of Austin City Hall on May 30, 2017. 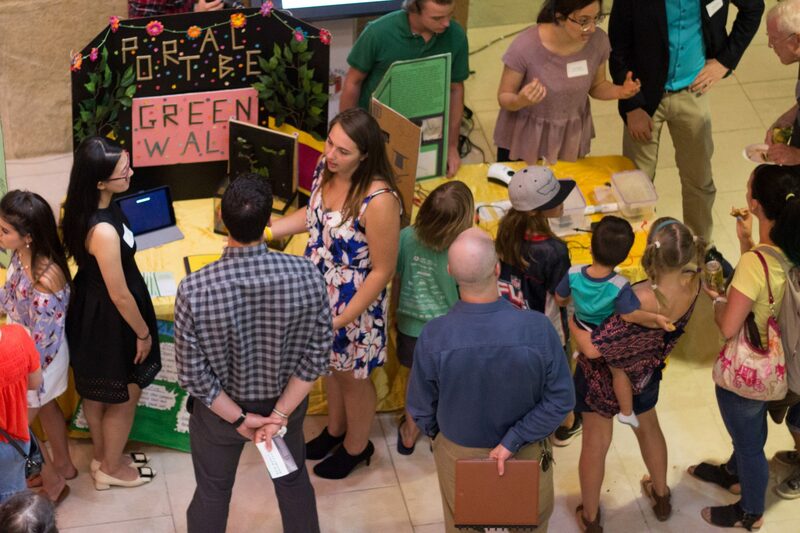 The 3rd Annual Central Texas Student Innovation Showcase proved once again that greener cities are on the rise, one school at a time. City of Austin Office of Sustainability officials, district and community partners, EcoRise Teacher Ambassadors, and parents heard students explain how they conducted environmental audits: analyzing data, creating solutions, applying for EcoRise funds and taking action. 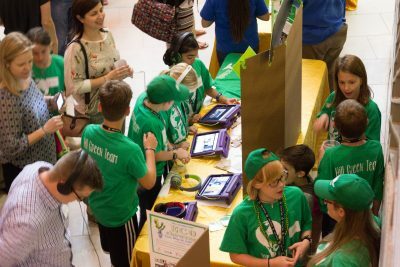 Guests examined biofuel cell prototypes, watched student PSAs, admired photos of campus gardens, and collected souvenirs like reusable water bottles and wristbands made of recycled materials. Every project centered around an eco-theme such as water, waste, energy, public spaces, transportation, food and air. Even Mayor Steven Adler – enthusiastically wearing a student-designed Composting: it’s a pile of fun! sticker on his suit – went from table to table, humbled by the breadth and impact of the innovations. 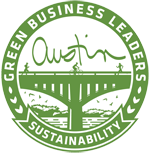 EcoRise and City of Austin co-hosts also presented two awards at the event. Brooke Elementary teacher Sam DeSanto received the EcoRise Legacy Award, given to an outstanding EcoRise educator who has demonstrated continued commitment to student innovation and sustainability on a K-12. In this case, DeSanto has been fostering sustainability on Brooke’s campus for an impressive 18 years. DeSanto’s students received EcoRise grant funding for a set of kid-sized beekeeping suits to help support their campus’ hives, from which they collected honey to sell at a recent farmers’ market. They were excited to share their work with important-looking visitors at the showcase. Kate Hoffner, Hill Elementary teacher and Green Team Leader, was named EcoRise Teacher of the Year (TOY), awarded to an outstanding EcoRise teacher who has demonstrated a commitment to student innovation and sustainability throughout the current school year. Hoffner’s students received Eco-Audit Grants for five unique, student-driven projects that aim to divert 35,000 pounds of waste from the landfill over the next 12 months. After completing their waste audits, Hoffner’s students used EcoRise funding to install a comprehensive recycling system in their campus’ public spaces, host a zero-waste lunch competition, and educate their peers on sustainability. The first-ever EcoRise showcase in San Antonio was held earlier in May, co-hosted by the National Wildlife Federation. As part of a larger community event, St. Mary’s Hall and New Braunfels High School presented grant-funded projects involving recycling campaigns and repurposing waste into campus art installations. But impact pulses beyond a compelling showcase presentation: all together, student projects will save an estimated 509,128 gallons of water and 29,826 KWH of energy over the next year, and divert over 1.5 million pounds of waste from the landfill. EcoRise funded over $30,000 in student projects in the 2016-2017 school year. Akins High School: Bottles You Can Refill, Not Landfill! Mendez Middle School: Chickens are Friends and Food!